Richard O’Neill is happy his doctor recommended he get his lungs screened for cancer. O’Neill, 73, of Council Bluffs, said he’s thankful he caught his lung cancer early. The Council Bluffs man was a smoker for more than 50 years, and earlier this year decided to get tested for lung cancer. We caught it way early, so it was good,” he said. 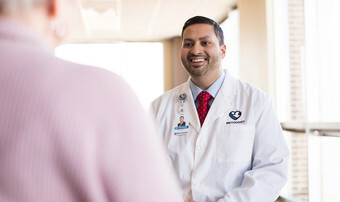 Dr. Sumit Mukherjee with the Methodist Physicians Clinic at Jennie Edmundson Hospital explained that the scan — for individuals at risk of lung cancer ages 55 to 74 — has proven effective to catch cancer early. Those risk factors include smoking and exposure to cancer-causing toxins and chemicals.